Another year is beginning, which (for the devoted burners) means assembling the gear for another year at Burning Man. Each individual will have a unique packing list depending on what he or she is planning on bringing to share and add to the festival. 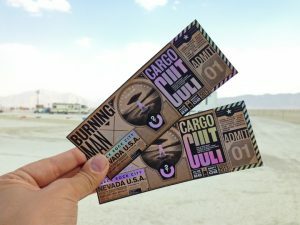 Following is a list of essential Burning Man supplies, which every participant should consider including in the luggage, backpack, or trunk of the car. Water should be on the top of every attendant’s list. There is no water available in Black Rock City, though there is ice for purchase. But the ice available will not be adequate to hydrate and clean the entirety of the community. The organizers suggest you bring 1.5 gallons for each day. That allows for a full gallon of drinking water and another half-gallon to take care of basic cleanliness (like scrubbing those dishes and getting the sand out of those crevices it will undoubtedly wriggle its way into). Consider bringing enough to share; gifting is an essential part of the ritual. Don’t forget a method for cooking. Open fires are allowed only in designated areas, so you will probably want a heat source other than burning wood. A camping stove is always a safe bet. The desert sun is brutal and unrelenting. If you don’t usually spend all your days splayed out underneath a blistering sun, then chances are you’ll want to have something like a set of tents to provide a little shade. Tents also provide a bit of privacy if you ever want to take a moment for personal contemplation. Another option would be constructing a shade pavilion. Burning Man is based on a gifting culture, especially as there is no commerce allowed. For some this means bringing along the tools to create large art installments or adult-sized playgrounds. Others bring along music to share and participate in. Some simply share ideas. Figure out your niche and bring some gifts that showcase what you have to share. There is plenty more to consider while getting ready for spending a week in the desert with an assortment of wonderful people. Take your time and plan ahead. To see what the organizers suggest, check out the survival guide provided on their website. The most important part of your Burning Man packing list is an open mind and spirit of play—it’s going to be an unforgettable experience.